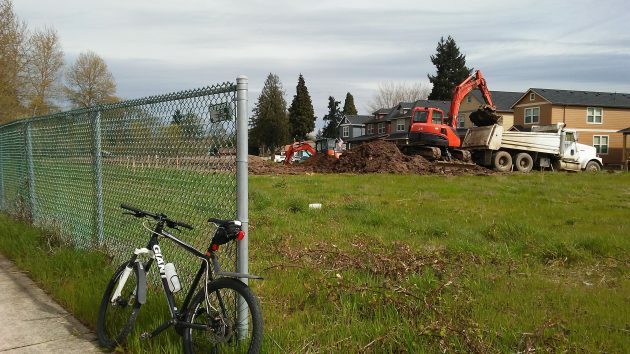 At Edgewater Village on March 28, excavating for the first two houses backing up to the Dave Clark Path. Let’s check in once again on Edgewater Village. There, the Albany urban renewal program has just increased its investment in the project, and construction is under way on the first two houses along the Dave Clark Path. As recommended by its advisory board in February, the city council, acting as the Albany Revitalization Agency or ARA, on April 19 approved a payment of $315,600 to the developer of Edgewater Village. The sum represents the city’s share of the cost of constructing public streets and related infrastructure adjoining a piece of city-owned property right in the middle of the development, across the railroad tracks from Water Avenue. The city’s share is 16 percent of the total street and utility costs for the second and final phase of the 58-lot development between the railroad tracks and the riverside path. The developer, George Diamond, will pay the rest of the street costs or $1,677,115. The total was based on a bid for the work by BRX Inc. of Millersburg. City participation in the street costs next to the vacant acreage, which Albany obtained at no cost from the BNSF railroad, helped Diamond get bank financing to complete the multimillion-dollar development. The CARA board heard Wednesday that the bank financing had been accomplished. Several years ago the Central Albany Revitalization District invested $2.4 million in the property, starting with cleaning up the 6-acre site after a fire destroyed a dormant fish-packing factory there. The amount has become a loan that is being forgiven in pieces as houses are completed. The city is in about year 23 of its 10-year plan to end homelessness. But yet the homeless folks still show up alive and dead along the river path. Now the city is in year 11 of Edgewater, and as you said rather confusingly, 11 houses have been sold but are being rented until being sold. Huh? It sounds like not one buyer has been found, and in an act of desperation the developer purchased the homes himself. Please clarify. In 2007 when the project consisted of 146 townhouses, someone from the city promised that affordable, working class housing would be built along the river. Fast forward 10 years and the Lake Oswego developer has built a total of 13 single homes and wants $368,000 each for the two homes along the river path? Man plans and God laughs. The guffawing has become a roar. Is CARA listening? Yes Gordon, CARA listens, advises, and then ARA acts. Notwithstanding your out of state whining & complaining, our URD is doing just fine… I’m very pleased our ongoing success still benefits Albany – and will continue to do so thanks to our elected officials back in 2001. Maybe those way over priced units would sell if the developer made it like a “high class” gated community. And make the City re-route the bike path around it so residents wouldn’t have to share their view of the river. Hey Ray, nothing like demonizing & belittling those who present good hard facts to try & boost your position. CARA’s justification at times is like the junk science of years ago that tried to prove vaccines caused childhood ills. In as much as some people like to whine about CARA and the benefits it provides, I’d like to invite Gordon and the like to find a parking place downtown on a Fri or Sat night! Business is doing much better there than the years before this program began. CARA has been a huge benefit to this city and really saved it from decay.